For a while we were contemplating the idea of a hamper for Christmas and whilst they undoubtedly a joy to receive, they aren’t necessarily the best value for money, but obviously that isn’t really the point. Then we struck upon the idea of creating our very own selection of festive goodies from locally sourced produce and what better place to start we thought than the Tunstall Village Food Festival. Not entirely sure whether this is new or has been going for years, but we had certainly not attended before, so with the aim to beat the crowds we set off for the start. This was a real treat and exactly what we were looking for, with stalls selling all manner of food and drinks. 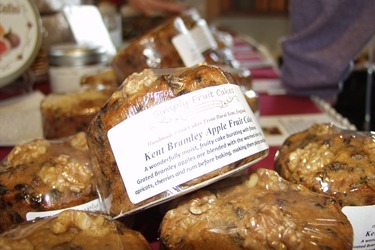 Who could resist the wonderful selection of fruit Cakes by Sarah Belcham-Smith of Simply Fruit Cakes, so first item bagged was a Branded Apricot Fruit Cake. You can’t have Christmas without some Cheese so we bagged some Canterbury Cobble from Ashmore Cheese by Cheesemakers of Canterbury, although sadly that didn’t last long, as we’ve already devoured a fair portion of this. Feeling adventurous, then you have to try something from Sittingbourne’s very own John Anthony McLauhlin who trades as John’s Kitchen, so a jar of Pickled Chilli Onions went in the bag followed by Fruicohol Dates in Rum. Yes I’ll have to let you know if we survive the latter. And last but certainly not least local lads Pate Cole and Ray Forward of Applegate Farm Butchers who were cooking up business with some sizzling sausages 01795 842006.